I love to cook and Mediterranean isn't really a favorite of mine, but I had the chance to try out DedeMed's 7 Spices. It's an all spice and sounded really good. It says right on the website that the 7 spices is used with meats, rice and vegetables. So I took a basic recipe. Chicken chopped up, over rice with mixed in broccoli. And I added some of this 7 spices. Not too much, I figured I could always add more later. And it was actually really good. Now it wasn't an everyday Mediterranean recipe, but I made it my own and added the spice. It was good and I recommend everyone trying a spice they wouldn't normally and add it to a dish one day. It might become you're new favorite. When we got the spice in the mail. I opened it up and took a wet finger to the lid and tasted it, it was STRONG! So I only added 1tsp to the entire recipe and it was enough. Not too strong and not too weak, it was just right. SO GOOD!!! 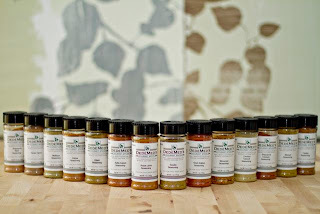 DedeMed Spice blends are manufactured using the highest quality, premium spices sourced from all over the world. They are expertly blended to provide a balanced, authentic flavor true to their heritage. All of the spice material is fresh, vibrant; and has been cleaned and treated for microbiological contamination. DedeMed Spice Blends are manufactured in a facility that uses Good Manufacturing Practices and currently has a "Superior" Food Safety Rating from the American Institute of Baking. Price: $8.95-$10.95 for one. $24.95 for 3 and $89.95 for all 15 that they offer. I would like to try the falafel spice. All their spices look great but I'd love their try their Tahini Sesame Paste. I'm a GFC follower (and I hopping over here from Thirsty Thursday but also noticed you were interested in Twisted Scavenger crew so will be emailing you from there shortly. Have a great day and this is a really nice give away. I would like the falafel spice! I would love to try the Seven Spices! I'd get the 7 spices blend. I'd love ot try the kibbeh spice. I am especially interested in the Seven Spice (prize) since I've long tried to make my own Mediterranean seasoning blend - with varying degrees of success! I would also like to try the Kafta seasoning and the Roast Lamb spice.